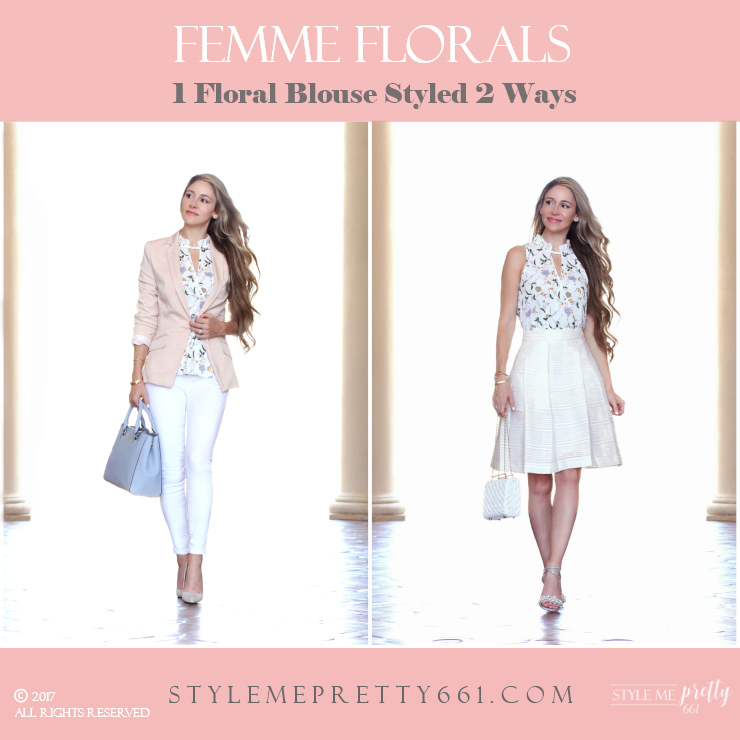 StyleMePretty661: Femme Florals Styled 2 Ways + Giveaway! Though Summer is winding down officially in a few weeks, temperatures here in L.A. continue to soar, reaching upwards of 110 degrees. This heat wave is insane! It has actually caused an "extreme heat alert" to be issued in my residential area for all of this week. I honestly can't complain, though; it's all quite trivial compared to the utter devastation that Hurricane Harvey has wreaked on southeastern Texas recently. It's utterly heart-breaking, and my love and prayers go out to all of those affected. As with all hot, Summer days here, I've been relying heavily on lightweight and airy pieces in various prints and patterns. One of my favorite prints, of course, is florals. Give me feminine, romantic florals any day of the week, and I'm a happy girl. In today's post I'm sharing how to style femme florals two ways that will take you from work to play. And the key piece that is central to both looks is a $13 floral top. Yep, $13. I spotted this top during a recent impromptu trip to TJ Maxx and immediately fell in love with it. I adore the floral print with its mixture of periwinkle and mustard blooms, green leaves and swirling blush blossoms. It reminds me of a pretty botanical garden. And the details and shape are so lovely, too -- the ruffled collar, the keyhole neckline, the faux-wrap front, and the swingy, peplum shape -- all such feminine details! Pieces like this always capture my heart. But I also have a small rule I try to adhere to when shopping: unless it's for a special/specific event, it has to be able to pull double-duty for both workwear and casualwear. That's the deal. It allows me to both maximize my budget and my wardrobe. And that's what brings me to these two different looks. This first look is an ideal business-casual outfit. The blouse is un-tucked and flowy, yet doesn't look sloppy or disheveled. I've topped it with a blush-taupe knit blazer (another recent, affordable find for only $35 at H&M) that adds some structure to the look, while also providing just enough coverage to the backside to keep the look polished and professional. I love the striped lining of the blazer, so I chose to roll up the sleeves a bit to allow it to show, which adds another layer of subtle pattern. I then paired the blouse and blazer with a flattering pair of white, skinny ankle jeans to keep the look clean and streamlined. For accessories, I played off the colors in the blouse, choosing a dusty-blue satchel and light-grey suede pumps. This look is light, crisp, and very versatile for Summer. When not in the office or when temperatures are just too toasty outside, simply slip off the blazer and you're still left with a pretty, feminine look. Or, swap out the pumps for sandals, which brings me to the second look. This second look is an ideal dressy look. It's one I'd wear for Sunday best, to brunch or dinner with family/friends or to a party that's not formal but still requires dressier attire. Here, the blouse is showcased on its own sans layers, and is paired with a winter-white flared skirt. This is a little trick I use to get double-duty out of my peplum tops: I tuck them into a high-waisted flared skirt. Since the skirt sits higher at the natural waist, it easily hides the smocked waist or seam of the peplum blouse. Such a fun option, right? 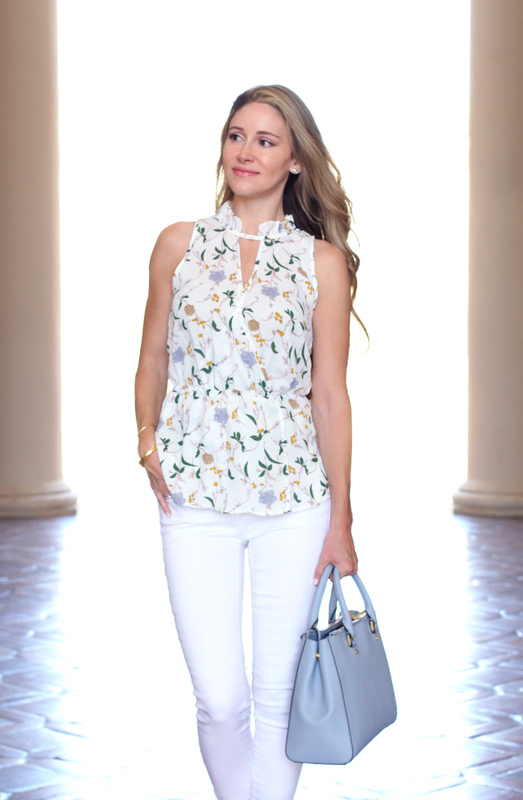 This trick works best with peplum tops that aren't too thick or bulky, and with flared skirts that can hide any minor bulk from the tucked-in peplum folds. This particular blouse is airy and delicate, so it tucks in to skirts nicely and gives the illusion of a simple wrap blouse. Pretty and versatile! Since I've been loving vintage wicker bags these days, especially for Summer, I chose a white wicker bag with gold chain handles to pair with this look. The chains keep the look dressy, and I also like that they can be doubled up to be worn on the shoulder or on the arm as a clutch. To finish the look, I added these embellished block-heeled sandals (which I shared in this post.) The grey faux-patent leather and the pearl-cluster details are darling and keep the look dressy and feminine. Since I'm not really keen on loop giveaways, I'm keeping it really simple and straightforward. To get started, please use the Rafflecopter entry-form below. Giveaway starts today, August 31st, at 12:30pm PST and ends September 8th at 12am PST. All entries will be verified and 5 individual winners will be chosen by random selection on September 9th. Winners will be announced September 11th here (blog post will be updated) as well as on my Instagram. Winners must contact me within 24 hours after they've been notified to receive prize; otherwise, new winners will be chosen. As always, thanks so much for stopping by and for all your support -- it truly means a lot!